Yellows and oranges are the most common colors we see and those are associated with decreasing sunlight during the day. Those colors aren't really affected by things like temperatures or precipitation. Your more vibrant colors, like your reds and purples, are different. You need specific weather conditions to see those colors. Namely, cool nights with dry and sunny afternoons. There are things that can shorten the color season, like strong winds or rain. The dreaded s-word can also end the season early. One thing we won't have to worry too much about this year is brown leaves. You typically get those with drought conditions, and we haven't seen much of that this year. For more information and updates on this year's fall color season, check out NWS Chicago's resource page here. After several days of high temperatures in the 80's, this afternoon may be a little shock to the system. Cloud cover and a chilly northeast breeze will likely halt temperatures from rising much past the upper 50's (if we're lucky) this afternoon. After a brief rise into the low 70's on Wednesday and Thursday, look for temperatures to take another dip for the start of the weekend as low pressure helps dislodge a chunk of Arctic air. A strong cold front will pass late Thursday night and early Friday. Showers and thunderstorms are in the forecast for Thursday afternoon with a few wrap-around showers likely on Friday. Dare I even say up north could have a few wet snowflakes mix in?!? The bigger story will be the temperature drop. Highs on Friday will have a hard time rising much during the afternoon and may in fact be reached early in the day with a steady, or falling, temperature throughout. Temperatures several thousand feet above will sit below freezing and this will help overnight lows Friday night fall into the 30's. Saturday night could be just as cold if warmer air from a quick moving system is delayed. With such a cool start Saturday morning, afternoon highs will struggle to make it out of the 50's for the afternoon! It has been a picture perfect first week of fall, with no rain and comfortable temperatures in the 70s. There isn't rain in the forecast for today, which makes it the fifth day in a row with no rain. But, with five more days in the forecast without rain, that will make this the longest dry weather stretch we've seen in almost exactly two years. The last time we went this long without rain was September 22nd through October 2nd of 2012. We did come come close this past July with nine days in a row. Fall officially begins in the Stateline Monday at 9:29pm. This means a lot of things: Changing leaves, sweater weather... and a lot less daylight. The start of fall, or the Autumnal Equinox, sees roughly the same amount of daylight and darkness. Over the coming months, though, our sun angle starts to lower and the amount of daylight we see goes down significantly. By the Winter Solstice (the shortest day of the year), our amount of daylight is cut down to about 9 hours. Just south of the view area, Mendota saw some flooding with water covering parts of Route 251 and Route 34. We are still monitoring the chance for severe weather and flooding across the Stateline Tuesday night into Wednesday morning. The latest satellite and radar has a few showers in the Stateline with the bulk of Tuesday night's storms still off to our southwest. Those storms are expected to move in closer to midnight. The primary concern will be flooding. 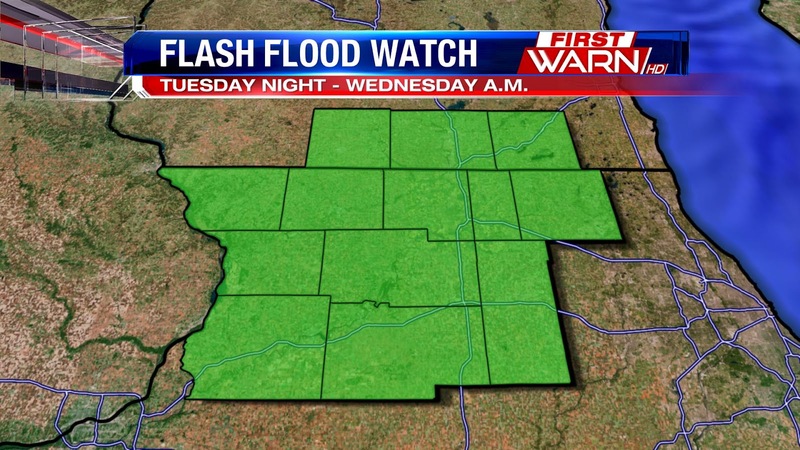 A Flash Flood Watch is in effect for the entire Stateline through Wednesday morning. Most areas are looking at 1-2" of rain through the morning. Areas with stronger thunderstorms could see locally heavier amounts up to 4-5". The secondary concern will be damaging winds. Even if we don't see any severe-strength winds, it will be breezy throughout the day Wednesday. Don't get used to the quiet weather we saw to start the work week. Plenty of big changes are coming over the next 48 hours. Storms will be possible overnight Monday and into the day Tuesday, but storms become likely Tuesday night into Wednesday morning. These storms have the potential for heavy rain and even severe weather. Futurecast has the bulk of these storms rolling through Wednesday morning with our next low pressure system. The timing of these storms should help suppress the severe threat a little, but we'll still have to keep an eye out for a few stronger storms. Typically, severe weather is more likely during the afternoon when storms can feed off the heat and humidity of the day. Since our storms will be mainly at night or early in the morning, our severe chances are reduced. Tuesday's severe threat should stay mostly to our west. Wednesday's severe threat will be mainly to our south. If we do see severe storms, damaging winds will be the biggest concern. Heavy rain will be the most likely problem with this next system. Models are indicating that a good 1.5"-2" of rain will be possible through Wednesday evening. If we do see severe storms, locally higher amounts will be possible. 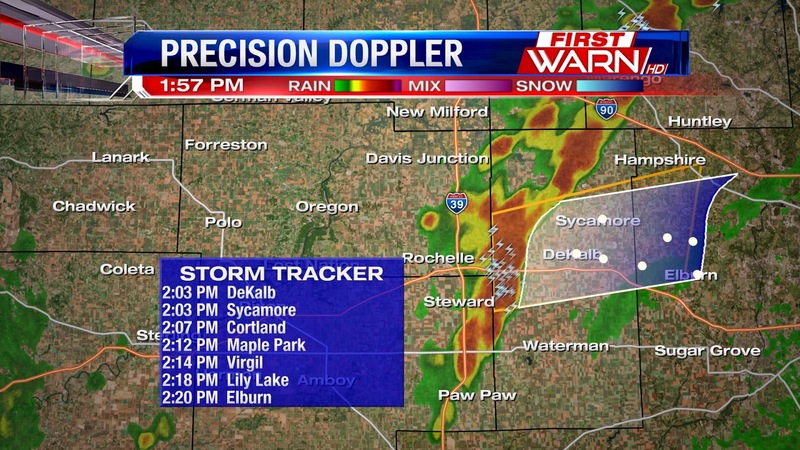 2:00pm Update: Severe T-Storm Warning for central DeKalb County until 2:30pm. Warning includes the cities of DeKalb and Sycamore. 60mph winds are possible. 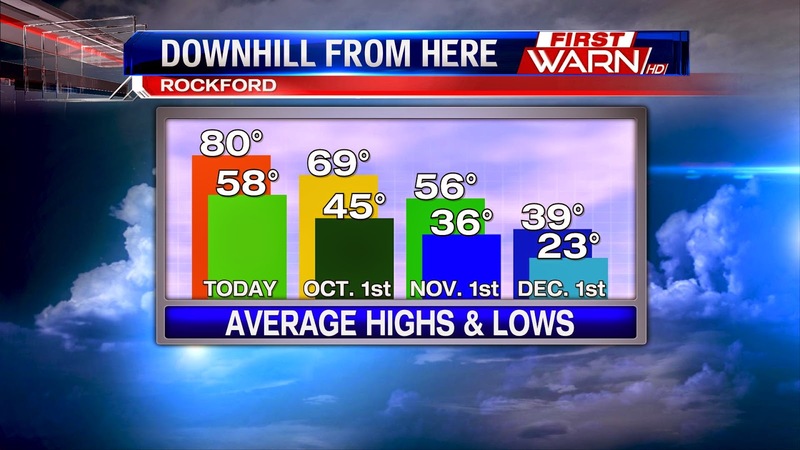 The forecast high for the Rockford area today is 90°. A warm front passing through the area combined with strong winds from the south and minimal cloud cover are all contributing to the surge in heat. There has been some cooling this morning because of thunderstorms and cloud cover, so temperatures could be held back a bit this afternoon if the clouds hold together longer than expected. 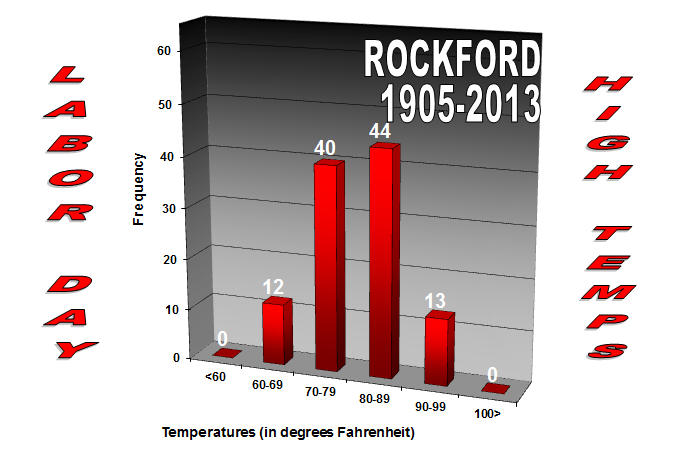 Highs in the 90s are more likely to the south and west of Rockford with heat index values in the mid and upper 90s. But how likely are 90s in September? Looking back at past climate data, you can see that last year we had four 90 degree days. That number decreases every year we go back. In 2009, we saw no 90 degree days in September. While it's not extremely likely, it does happen occasionally. We haven't seen much extreme heat this summer, so when Thursday's forecast calls for a high of 90°, it's important to remember heat safety. Most of the reminders are obvious. Drink plenty of water. Wear light-colored and loose-fitting clothing. But the most important tip to remember is NEVER leave children or pets in a car. We've heard national stories all summer long of children being left in hot cars. Here's another reminder why that is so dangerous. 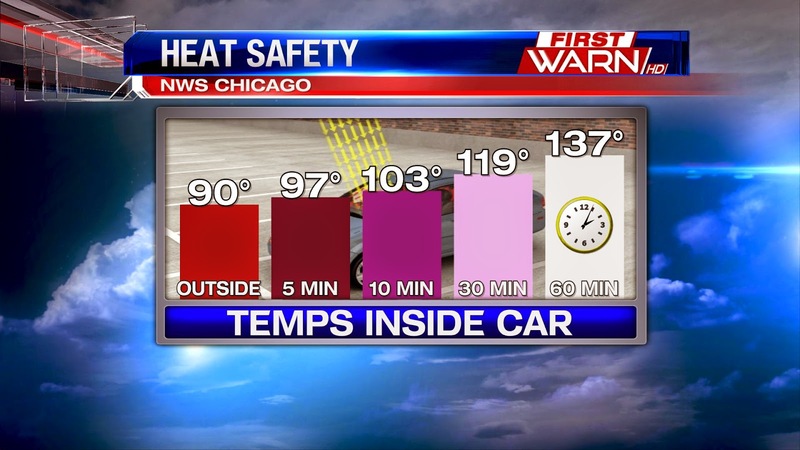 When the outside temperature is 90°, the temperature inside a closed car can top 100° in less than 10 minutes. After 30 minutes, the temperature inside a car is already flirting with 120°. Give it an hour and that temperature is almost 140°. 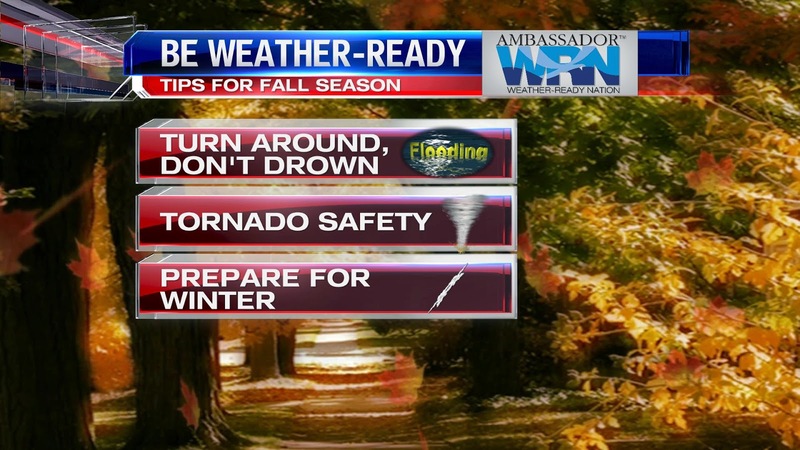 Are You Weather-Ready for Fall? We haven't promoted this much yet, but the First Warn Weather team is the official Weather-Ready Nation ambassador for the Stateline. That means it's our goal to keep you prepared for extreme weather all year long. As you may already know, Monday was the official start of meteorological fall. If you're not ready to let go of summer just yet, don't panic. Astronomical fall doesn't begin until Sept. 22nd. Either way, the seasons are changing, and that means changes to our overall weather pattern. Labor Day weekend is considered the unofficial end of summer for many, but in the weather world, summer really is over as meteorological fall begins September 1st. 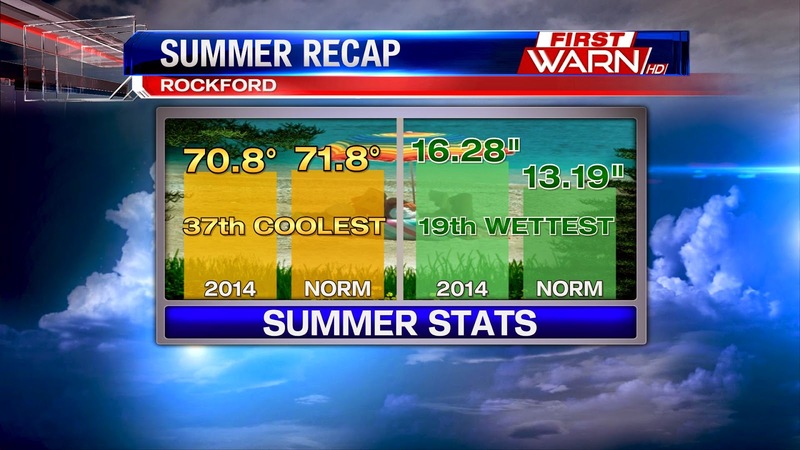 Here's how our past summer shaped up for Rockford. Temperatures today will climb into the low 80's with winds from the SW gusting at 25mph. Pop-up scattered storms are expected through the late afternoon and into the early evening. We could see some quick heavy downpours with these storms but the severe threat will be to the SE of our area. But is this a typical Labor Day forecast? The forecasted high for today is 81° which is in the most frequent range of temperatures on Labor Day. Forty-four Labor Day high temperatures have fallen in the 80-89° range in the last 105 years. Forty days have been between 70-79°. After that only 12 days have been between 60-69 °, and 13 have been between 90-99°, so today's temperatures is right around normal. But with scattered storms in the forecast for today, is rain typical on Labor Day? 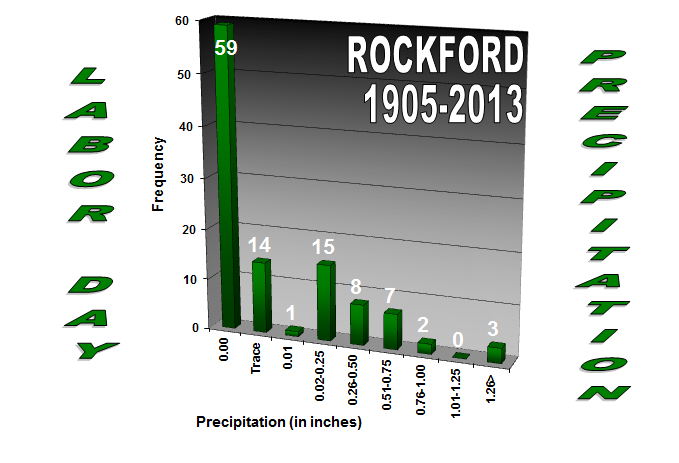 Since 1905 there have been 59 Labor Days with no rain recorded, while there have been 50 days with rain recorded. While typically there isn't rain on Labor Day it definitely isn't uncommon. Today's rainfall amouts should be in the .10"-.25" range.